We have finished our summer work camping job at Luton’s Teton Cabins, just east of Grand Teton National Park. Dan feels the summer flew by, but I think it was just the right amount of time. There was snow when we arrived in May, and snow when we left in October…a lot of snow! We were the last ones to leave, as Dan was busy steam cleaning the carpets in the cabins. Although the weather was supposed to be 50s, we ended up with about 7 inches of snow! It was pretty though! It did make for an interesting drive over Togowotee Pass, at 9600 feet and a steep grade! And this is after they had “cleared” the pass! Normally we like to leave early in the morning when we are in travel mode, but we had to wait until late morning for the road to improve. We had another hard working crew this summer, and six of us will be coming back next summer. Last summer, with my broken foot, we did not get to do as much hiking as we had planned. This summer, we did many hikes, and even got our bicycles out. 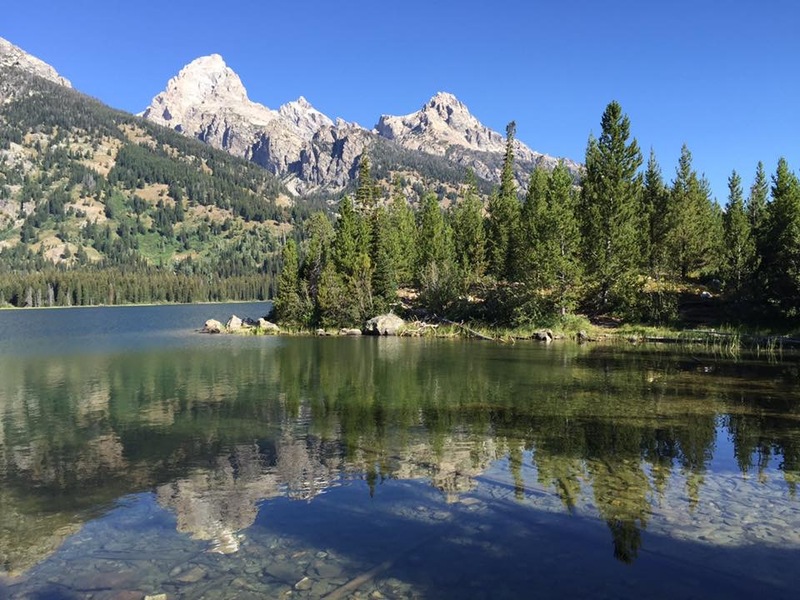 The Tetons and Jackson Hole are very bicycle friendly areas, with miles of paved paths. Dan and Al had a great summer fishing (and catching!) trout. After a slow start due to the spring flooding, they were able to get enough to have a pot luck fish fry for everyone. Al brought his inflatable Sea Eagle boat, and they floated down the river many times. The boat folds up into a small bag, and is strong enough to hold both the guys, and all their gear. The highlight of the summer, for me, was seeing (and experiencing) the Solar Eclipse. You can read about that here. A close second was watching a grizzly and her two cubs, feasting on berries. (a special thanks to our co-workers Karen and Al for texting us when they spotted them in the park – about 2 miles from us). We also had a bull moose run right across the road on our way back from the grocery store. I have learned to always carry my camera in September, as the wildlife is very active. After we left Wyoming, we had a long travel day and stopped at the Cabela’s in Rapid City, South Dakota, which lets you stay overnight in their parking lot. We were woken up very early to an alarm going off. We though it may have been our carbon monoxide detector. We both woke up in a panic, and started searching, only to discover it was our temperature gauge, which has an alarm clock. We have had this for over 8 years, and never knew it had an alarm clock! Apparently when we packed it up and put it away for travel, a button must have been pressed to set the alarm. And 10 minutes later…we discovered it has a snooze feature! Since we were up early, we just got on the road (it was 5 am), and watched the sunrise as we traveled east. We are now back in Wisconsin. Originally, we planned to be here a few weeks, then head down to Amazon in Kentucky. However, our friend Mike’s bar and grill that we had helped remodel is not yet open. He was very busy this summer with his landscaping business, and did not finish the remodeling. So we are back helping him out, probably through Thanksgiving, and then we will head south for the winter.